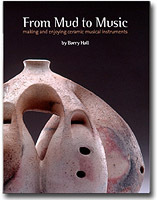 From Mud to Music is the only comprehensive book written on the fascinating topic of ceramic musical instruments. In the book and its companion CD, author Barry Hall explores the astounding array of instruments made from clay, from ancient times through todays modern innovators. All instrument families are represented - drums, winds, strings, and even unique hybrids  with detailed descriptions of how the instruments work and how to make them. This large format book with over 500 color photographs and a 74-minute audio compact disc features the work of over 100 ceramic artists from around the world spanning the last three millennia, from ancient Peruvian water whistles and Mesopotamian rattles to contemporary seven-chambered ocarinas and globular horns. For inquiries about From Mud to Music, please contact Barry Hall.